New Order documentary Decades gets a rare public outing at Liverpool’s British Music Exhibition and Getintothis’ Banjo reflects on just how singular a band they are. New Order are a special band. The fact that they survived their own origin story is impressive enough, but for them to then go on and become one of the most important and influential bands of their era is little short of astonishing. It also marks them out as gifted and determined people. To rise from the ashes in such style is, I think, unprecedented in modern music. They made some of the best music the 80s and 90s saw, combining human soul and machine-based dance music. They have had more than their fair share of hard times but have come out of these happy and comfortable in their middle age. As every New Order fan will surely know, they are now without key member Peter Hook, whose bass lines defined their sound, adding a human heart to their electronic pulse. But again, they have not just survived, they have thrived. Their last album, Music Complete, is one of their very finest, proving that New Order are a band you should never write off. In 2017, New Order set themselves another challenge; to perform without their trusty emulators, loops and computer driven keyboards, replacing these with a ‘synth orchestra’ of 10 people who would play all of these sections live. 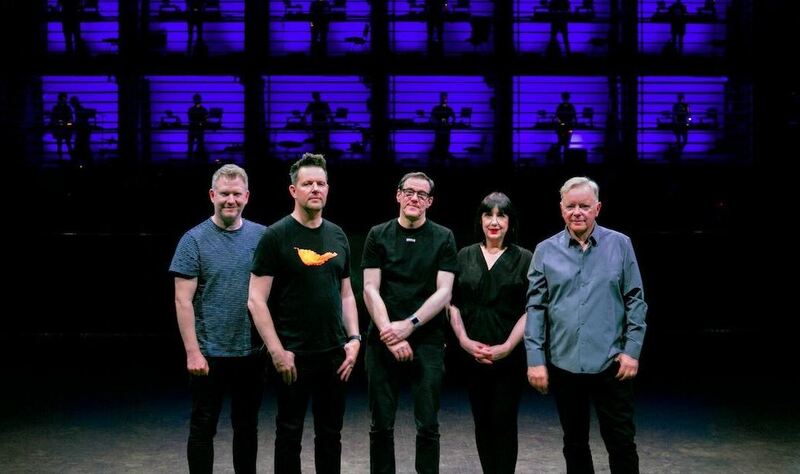 At this stage in their career, New Order could be forgiven for kicking back a little and taking their greatest hits set out on the road for the rest of their career. But New Order didn’t become New Order by choosing the easy path. Decades is the story of the synth orchestra gigs that took place in Manchester, Vienna and Turin, with superbly shot live footage and interviews with those involved, including all members of New Order, the synth orchestra members and the artist behind the show Liam Gillick. Tonight, Decades is being shown at the British Music Exhibition in Liverpool’s Cunard Building. Dave Haslam introduces the film by telling us of his experiences with New Order and Joy Division. He points out that, although both bands are now hugely celebrated, it was not always like this. Ian Curtis’ death may have been a huge, crushing blow to Joy Division’s early fans and has since become part of his enduring legend, but at the time it was barely mentioned away from the music weeklies. It was not important enough at the time to make national news and even his local newspaper the Manchester Evening news only devoted three paragraphs to his suicide, and even then they spelt his name wrong. It is perhaps no wonder that New Order were known for being sullen. One of the things that comes across in the documentary is how happy and open the band are these days. Their early interviews were known for being awkward, with the band usually recalcitrant and uncommunicative. Steven Morris shows himself to be a natural comedian and even Bernard Sumner is in smiling and happy form throughout. In his introduction, Haslam tells us that the cause of this contentment is the fact that Peter Hook is no longer in the band. Not that this is intended as a slight against Hook, he explains, just that when two people who are opposites of each other are forced into working together in such close proximity it can make things difficult. When we are young we perhaps gravitate to people we want to be like. For introverts, this can mean befriending more outgoing life and soul types, while the more overt characters may be impressed by others’ calm approach to things. In New Order, this seems to have grown into a relationship where one person wants to permanently be on stage or on the road while the other wants to spend his time in the studio, tinkering with technology. It seems New Order’s biggest strengths also contained the seeds of their potential destruction. At one point in the documentary, Sumner looks heavenwards, offering a mock prayer that all their bad times are now behind them and they are allowed to be happy. The songs that are shown here sound re-energised by the addition of the extra musicians. The first song featured, Plastic, sounds huge and has become a wall of sound and it is impossible to stay still when it is played, even while sat down watching it on screen. The stage setup is stunning. The synth orchestra members are in two rows of boxes behind the band, with each module fitted with blinds that are open and closed throughout the show. They are all clearly made up to be a part of it, dancing away in their cubicles, making the most of being on stage with New Order. Wisely, Decades switches between live performance, interviews and fly on the wall style documentary scenes, which prevents any from suffering from documentary fatigue. The set, and film, reach an emotional end with Joy Division’s Decades, which the film draws its title from. An emotional song under any circumstances, its lyrics are made more poignant by their author’s absence. It is a fitting end to what look like a spectacular run of concerts. Where New Order will go next is anyone’s guess. They are adept at being difficult to second guess, but looking at their track record so far, we can assume it will be something different. And something beautiful. Share in the creation of a collaboration unknowling decades in the making.